How to subscribe to tags? I am interested in answering questions related to C#, Entity Framework and other Microsoft technologies. Is there a way for me to receive an email every day with lists of questions for each tag or keyword? Just go to the Filtered Questions page on the Stack Exchange site, and you can subscribe to tags across different sites over the network. You can set it to email you for the tags that you filter for as well. 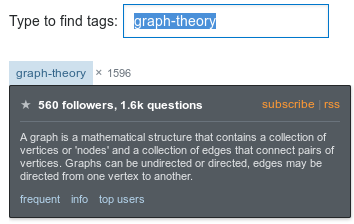 You can also just search for the tag here https://stackoverflow.com/tags and then hover over the desired tag and then click subscribe. Not the answer you're looking for? Browse other questions tagged support newsletter . Auto-Notifications for new questions in Stack Overflow? Why is it so complicated in Stack Overflow to subscribe to a subject?